This post was originally feature on Chicago Poker Club on September 28, 2009. On tonight's Windy City Poker Championship, down to 6-handed, the two chip leaders get into a heads up hand in which the chip leader perceives weakness from his opponent, and takes advantage to take down a good pot without a fight. Brent is in early position with a medium-strength A9 off. He looks at his cards, and then contemplates his action, showing his opponents his diffidence while considering his options. He engages in what WCPC-friend and interviewee Joe Navarro would refer to as "pacifying behavior", holding his torso, lowering his head, and rubbing his opposite shoulder with his palm. He makes a small raise to 25,000 chips, and the action folds to Chris on the button, who has 88. Normally, I believe Chris would probably just call here with 88, after some thought, but in this case I believe he has two strong indicators to make a raise. Brent's early position raise was smallish, and seemed tenuous. I believe Chris observed his behavior and did not read him for strength. 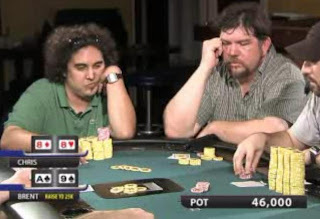 Chris and Brent are the two big stacks at the table; Chris is the only player that can eliminate Brent from the tournament, and Brent has been playing survival. Chris makes a small re-raise to 60,000 chips. At this point, there's 106,000 in the pot, and it would only cost Brent 35,000 to call. However, he started the hand with just 129,000 chips, so the call would reflect about half of that starting stack. Chris is effectively testing Brent's resolve by re-raising small, rather than pushing all-in. This move shows great strength, and is quietly putting Brent to the "All In" test.